I could go on with those masters of the past but even today Clyde Butcher is out there, lugging around an 8 x 10 view camera making wonderful black and white images along with many more who produce the majority of their work in black and white, using both digital and film. I shot this image the other morning with the Lumix FZ35 point and shoot camera. I hadn’t had it off the shelf since I got the Nikon D60 and I decided it needed a little workout! 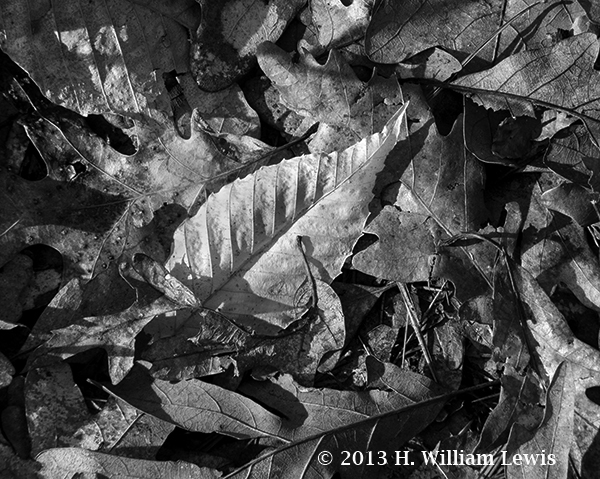 This image of the leaves was shot in RAW so it was in color, but the more I looked at it on the monitor, the more it cried out “I need to be a black and white image”! And you know what? It was right!! It’s been an interesting April here in Acker Woods this year. It’s been cold, rained and rained and then rained some more. The two lakes down the road, Big Acker and Little Acker, are at the highest they’ve been for the 10 years I’ve lived here. We’re in no danger, nor are any of the cottages on the lake since most are on high banks and where we live the water would have to rise at least 50 feet or more to make it to the front deck. And that’s a good thing! A lot of the folks in the surrounding areas on the rivers haven’t been so lucky as many of them are flooded. In fact, at least a couple of the major hotels in Grand Rapids on the Grand River were evacuated due to flooded basements. Flooded basements mean no electricity and we saw a news story that some of the guests had to walk down 12 or more flights of stairs in order to make it out. Imagine spending your trip to Grand Rapids in a shelter rather than your beautiful, expensive hotel room! Not fun! This image shows the outlet from spring fed Big Acker that feeds Little Acker. There were times last summer that there was almost no flow and Little Acker was at its lowest in years. Looks like these spring rains will be a good thing for both lakes. But, we have to admit we sure wish it would quit raining! Before I got interested in photography I wanted to be a painter. I was impressed with the way the artist could bring a scene to life with just a few strokes of a brush. But, alas, I had no talent in that area of the arts. No matter how I tried, what I produced could in no way be considered art. That is why I became interested in photography. Since, for the most part, my artistic views favored realism, the camera could bring my impressions of the world to life. Now, in the digital darkroom days, there is software that will add to that effect. 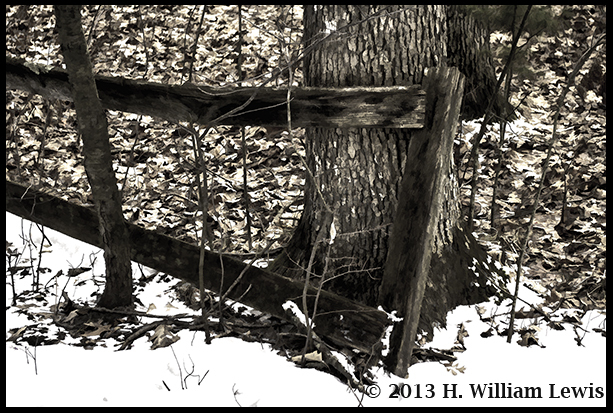 I took the color version of “Fence and Tree” into Topaz labs BW Effects and chose the “Painterly” effect. After a few adjustments in Photoshop I produced this image. The effect is subtle and doesn’t scream at you. In fact, you almost have to enlarge it to really see the effect. I don’t know about you, but I like it! 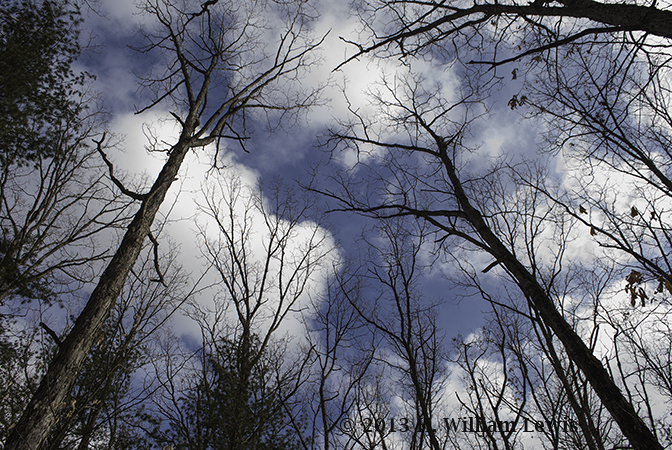 It finally looks like spring is really coming to the Acker Woods here in West Michigan. 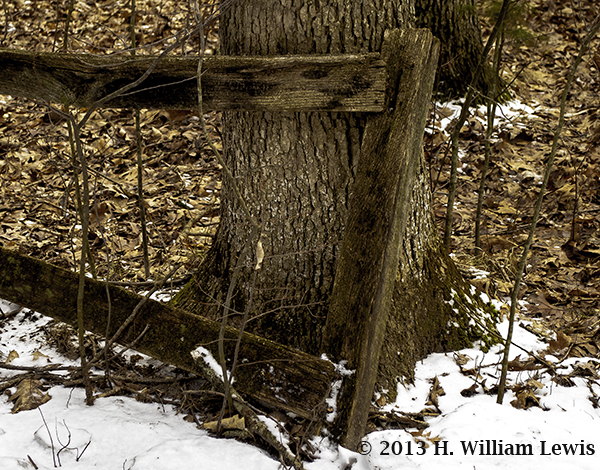 There is still some snow out in parts of the woods, but all the rain we are expecting this coming week should take care of that. Plants are beginning to push their way through the ground in Shirlee’s garden areas. The birds are singing their spring songs, Robins are looking for worms and the ground was soft enough last Monday for my step-son, Dan, to dig a grave so we could bury Flan behind her pen. Been talking the Nikon 60D with me on most of the dog walks, alternating lenses between the walks. I’m quite happy with the quality of the images I’m getting and it sure is neat to hear that “mirror slap” after every shot. I was a little concerned about carrying that extra weight around, but I have a good camera strap and I’m not noticing any problem. Still have to come up with a good way to carry the extra lens along with some of my Cokin filters when I head into the woods. There is a fishing vest in our local online auction I’m going to take a look at this week. I have read that they will often work. The other affordable option is the purchase of cargo pants with their large pockets. Always fun getting organized with new equipment! The attached photo is one of the very first ones I shot with the 60D and is available for purchase at Fine Art America, along with some other images I have for sale. 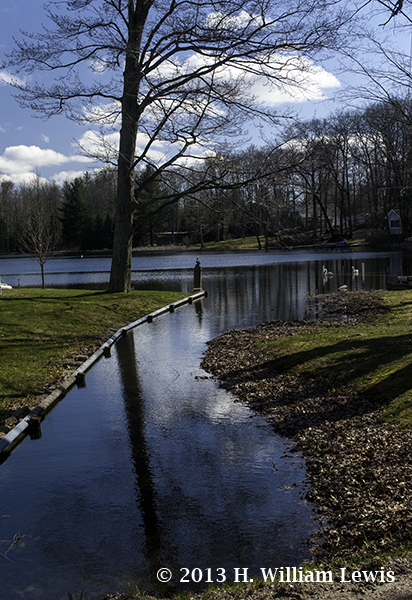 Really enjoying shooting with the new-to-me Nikon D60. Shoot a lot of images with the 18-55 this morning and then put on the 55-200 for the evening walk. Still holding the dog leash in the left hand and the camera in the right so changing lenses when I’m out with the dogs isn’t an option. Also getting used to manual zooming after a number of years of just pushing a button. Actually, it’s like getting back to shooting with my film cameras 8 years ago. Nice feeling, more precise zooming. 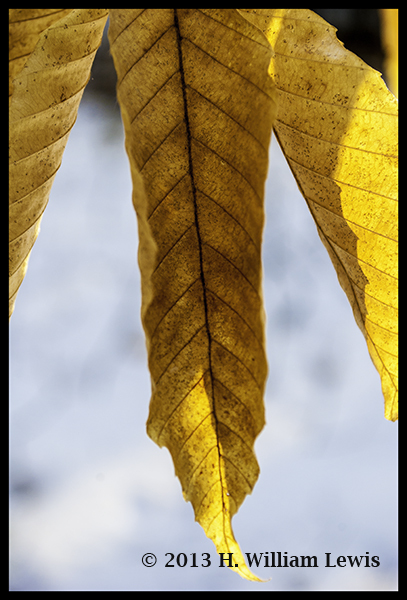 This is one of the leaf shots from this morning with the short zoom lens. Still amazes me to see the leaves in such good condition after a long, cold, snowy winter. Mother Nature sure seems to know what she is doing. For the past few months I have been wondering how the images from my Panasonic Lumix FZ35 compared with some of the lower priced DSLRs. I knew my daughter, Kitten and her husband Rob, had a Nikon 60D with a couple of lenses just sitting in a closet since they switched to Canon. I gave her a call a few weeks ago and asked if I could borrow the Nikon for some testing. She said she’d check with Rob and let me know. Fast forward to last Saturday when I got an email saying they had sent me the camera. Monday I received the camera and lenses. When I opened the box the first thing I saw was a full page note that said….”HAPPY BIRTHDAY AND….MERRY CHRISTMAS! (you can keep it). What a fantastic surprise and a great gift…..Thanks so much, Kit and Rob!! So here is one of my first images….what do you think? Writer-R-Me – Home of "Granddad and the Kid"